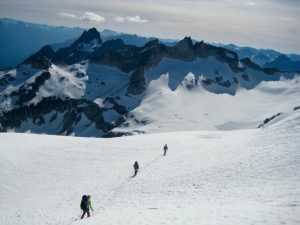 Over the long Independence Day weekend, Kevin K. and George W. joined Eileen and me on a six-day climbing adventure into the Glacier Peak Wilderness. Our goal was to climb Gunsight Peak and Sinister Peak. Eileen was the trip architect, and the rest of us were along to do the heavy lifting. 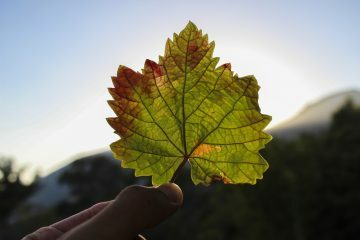 We were fortunate to have beautiful weather (except for a few foggy hours on Day 4), scant bugs, and no other people for the first three days. 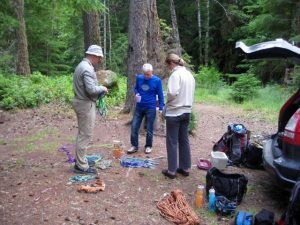 Day 1: Having driven up the Suiattle River Road and car-camped at the Downey Creek Trailhead on Wednesday night, we were able to get an early start sorting gear and arranging backpacks on Thursday morning. Our peak goals required lots of snow gear, rock gear, and glacier gear, including two full-length (60m x 9mm) alpine ropes. This did not make for a lightweight trip. At 8:00am, we shouldered heavy packs and started up the Downey Creek Trail, stopping along the way to sign the trail register. It was a brand new register, and our party—Team Sinister—was the first to sign in this year. The trail is in very good condition except for a dozen or more blow-down logs and numerous mud holes. We crossed Bachelor Creek on a large footlog shortly after noon (4.3 hours from TH), then began a hot, slow slog up the abandoned Bachelor Creek Trail. In a brushy area near elevation 4100 feet, we crossed back over Bachelor Creek on another footlog and continued up the now-very-overgrown trail through a series of slide alder thickets. Our day ended at an informal but well-used forest camp in “Bachelor Flats” near elevation 4500 feet (9.7 hours from TH). Day 2: We were packed up and moving again by 8:00am. The old trail took us through the boggy flats and then up a steep blowdown area before curving into the welcome basin of Bachelor Meadows. 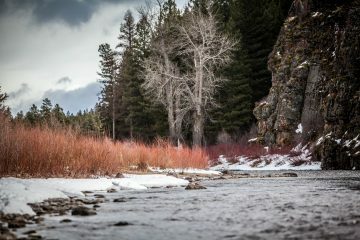 Snow slopes led up to Cub Pass, and bare slopes led back down to still-frozen Cub Lake. A recent avalanche or mudslide has obliterated part of the old trail here, but the route is not difficult to follow down to the lake outlet (3.7 hours from Camp 1). 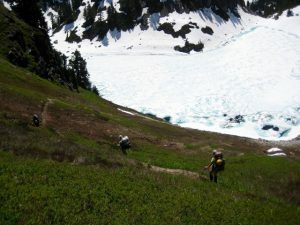 We continued up through Cub Lake Meadows and over Itswoot Ridge, then made a long traverse over to the Dome Glacier. Snow coverage was 95 percent. By staying high on the Dome Glacier, we were able to skirt all of the large crevasses. The prevalent “hairline” crevasses were easily stepped over. It was late in the day when we rounded a bergschrund and climbed the final snow finger to the 8500-foot Chikamin-Dome col (1 1.6 hours from Camp 1). There is a well-established campsite at the Chikamin-Dome col, with enough room for a small tent or several bivouac sacks. After a half-hour of earthwork, we were able to enlarge the site sufficiently to accommodate George’s four-person pyramid tent. 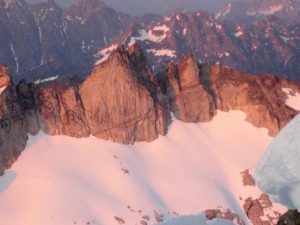 From our high camp, we watched a pink glow wash over the ominous black rock of Agnes Mountain…and the friendly gray granite of Gunsight Peak. Day 3: Following a surprisingly calm night at the high col, we broke camp and headed down the Chikamin Glacier. The uppermost part of this descent oftentimes involves some technical trickery to get over the bergschrund, but we were delighted to find a walk-off route due to the heavy snowpack this summer. A 90-minute descending traverse took us to a 7000-foot snow dome and rock outcrop closely below the shadow of Gunsight Peak. After dropping off backpacks at the outcrop and loading summit packs, we booted up to a snow finger between the main and south spires of Gunsight Peak. Kevin and George studied the beta graciously provided by Fay Pullen, who had climbed the main spire last year, and were able to scope out a good route for us. From a breach in the snow finger, George led up a short wall to a broad ledge, then leftward to a steep dihedral of black rock. The uppermost 15 feet of the dihedral features exposed 5.6 moves over solid granite and was the technical crux of our route. Once past the crux, we traversed farther leftward on Class 3 granite to enter a distinctive dike of reddish-black basalt. 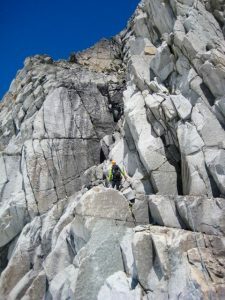 This dike provided a somewhat loose but fairly easy scrambling route to a high notch that separates the main and north spires. Because a vertical headwall prevents a direct climb out of the main-north notch, we descended about 20 feet and then made a rightward traverse across steep, solid, well-broken rock to reach a shallow, parallel gully. This deviation was not immediately obvious to us, so we actually spent a couple extra hours trying to tease out the correct route. 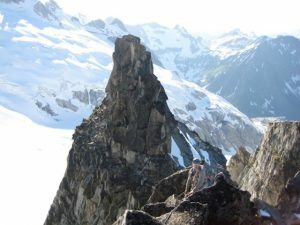 A series of short chimneys and cracks ranging up to Class 5.5 ended at the ridge crest adjacent to a large horn adorned with numerous rappel slings. This rappel station provided a welcome confirmation that we were truly on route. 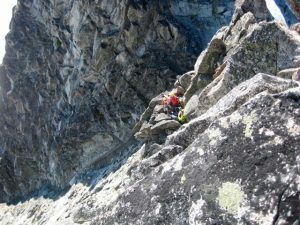 The narrow ridge crest involves wildly exposed but very enjoyable climbing over a jumble of large and remarkable solid granite boulders, with moves ranging from Class 3 to low Class 5. We topped out at 6:30pm (7.1 hours from Camp 3). The slightly lower north spire towered nearby. The summit of Gunsight Peak is a tiny horn of rock roughly the size of a barstool. We had to take turns tagging the horn. To the west, Sinister Peak rose out of the Chikamin Glacier like a breaching whale. 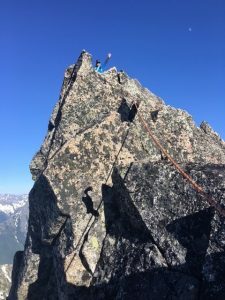 We belayed each other back down the exposed summit ridge, then made a double-rope rappel down the west face. From there, we were able to scramble down several hundred feet to the top of the black dihedral. Kevin led off a diagonal double-rope rappel, putting in directional protection along the way, which allowed us to reach the snow finger in one shot. The sun was just dropping below the horizon as we descended soft snow back to our campsite on the glacier (2.8 hours from summit). As a team, we solidified our reputation for somehow managing to use up every available minute of daylight on every climb. Day 4: After another starry night, we awoke to cloudless skies and a frozen snow surface. Our group was in no hurry to leave this superb campsite, so it was 10:00am before we were packed and ready to go. 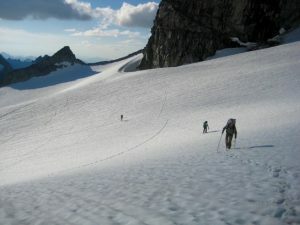 We made a rising traverse back across the Chikamin Glacier, aiming for the Dome-Sinister saddle. Our traverse route took us through the deposition zone of an avalanche that had recently occurred on Sinister Peak. This avalanche originated as a triangular snow patch high on the mountainside. None of us had ever seen such a clearly defined origination zone. At the Dome-Sinister saddle, we encountered three climbers who had just traversed over from Cub Lake this morning. 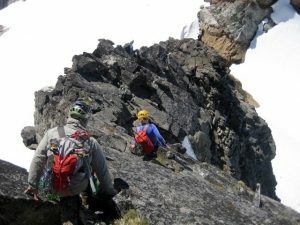 They headed up Sinister Peak’s west ridge, whereas our group elected to follow the traditional southwest route. 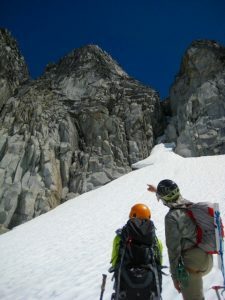 We contoured around the ridge on an easy snowfield and then climbed up to a prominent gully. This turned out to be one of the loosest, most unpleasant gullies we’ve ever had the displeasure of climbing, and none of us was eager to descend the same way. With the ugly gully behind us, we enjoyed a Class 2-3 scramble along the upper west ridge. The other party was far ahead of us at this point. 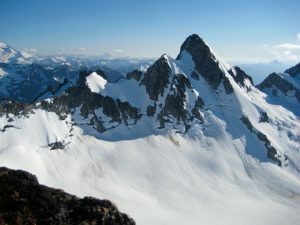 …and the Ptarmigan Traverse peaks to the north. On descent, we retraced our route down the upper west ridge. 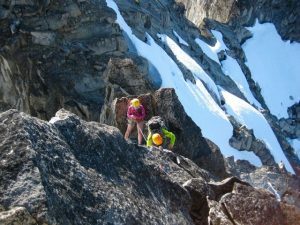 Rather than down climb the ugly gully, we followed the other party down the lower west ridge. 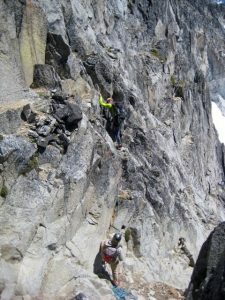 This relatively new route involves some white-knuckle Class 3-4 scrambling on semi-solid rock. A fixed sling had been placed at one particularly tricky location, and there was considerable exposure along much of the route. We were happy to finally reach the gentle slopes of the Dome-Sinister saddle. The remainder of our day consisted of a 1400-foot ascent to the Chikamin-Dome col, then a long traverse back over to Itswoot Ridge and down to Cub Lake. Many climbers had made this traverse during the past two days, so we merely followed the snowy freeway. 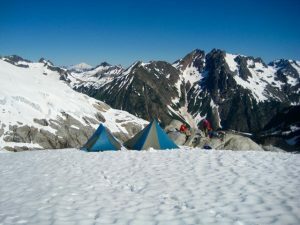 Five or six climbing parties were camped on Itswoot Ridge, and another 10 or 15 parties were camped in Cub Lake Meadows when we arrived at 8:30pm (6.5 hours from Sinister Peak summit). That night, the dozens of shining headlamps gave the meadows a party atmosphere. Day 5: Although light fog had hung over the meadows throughout much of the night, it was completely gone by morning. We had a leisurely breakfast in the sun before Kevin and George wandered off to chat up some of the other campers. 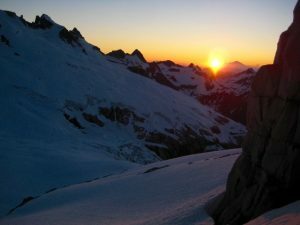 One party comprised a dozen NOLS instructors and students, all heading over to Dome Peak. We were also surprised to see two trekkers carrying backcountry skis and wearing telemark boots. This pair turned out to be James Hamaker and David Burdick, who were just completing a ski version of the Ptarmigan Traverse. Eventually, we were packed up and heading over Cub Pass. We followed the well-beaten trail down through Bachelor Meadows to the 4500-foot forest camp in Bachelor Flats. However, rather then staying on the old trail from here, we crossed Bachelor Creek and descended heavy forest parallel to the creek. Recent beta indicated that this north-side route has recently become the preferred option, and we would certainly concur. Even when the forest gives way to thick slide alder, a hacked-out boot path provides fairly easy travel down to the main trail at about 4100 feet. Had we discovered this new route on Day 1, we could have saved ourselves some time and frustration. Oh well…next trip! By the time we reached Downey Creek, it was nearly 6:00pm, so we all agreed to spend another night in the forest rather than hoofing 6.5 miles out to the trailhead. A small campsite 3 miles farther down the trail (9.0 hours from Camp 4) served us well for our last night out. Day 6: We were all up at first light and ready to go by 6:15am. In the cool of the morning, the remaining 3.5 miles of trail seemed like an easy stroll. This is always my favorite way to end a long mountain trip. Just before reaching the trailhead, we stopped to look at the trail register. It immediately confirmed our impression that many, many people had come up to Cub Lake and beyond: a whopping 18 parties—a total of 54 people—had signed in behind us this weekend! Team Sinister was honored to have led the charge. Total stats: 34 miles traveled; 14,000 feet gained and lost.